Rochester Institute of Technology received a B.
Washington Monthly's ranking of 203 out of 224 of Affordable Elite Colleges - Overall Rank was a major contributor to this grade. If you can stand cold weather, Rochester Institute of Technology offers a demanding arts and technology school that has valuable relationships with major industries, state-of-the-art facilities, and an intense (but not cutthroat) student body. Located as it is in the hometown of Xerox, Kodak, and Bausch & Lomb, RIT provides its career-minded students with plenty of opportunities for internships. Describe the type of student who should not attend Rochester Institute of Technology and explain why. Describe the type of student who should attend Rochester Institute of Technology. Why? What is a typical Rochester Institute of Technology student like? Describe the type of person that should attend Rochester Institute of Technology. Anyone and everyone! RIT is the perfect school for everyone, no matter what college you go to there will always be a group of people that you fit in with. What are the top 3 reasons someone should attend Rochester Institute of Technology? RIT is an awesome school. The campus is beautiful, the professors are great and there are so many new people to meet. What was a typical Rochester Institute of Technology student like in high school? Describe the type of person that should attend Rochester Institute of Technology. A typical RIT student was slightly introverted and interested in technological, fantastical, scientific, or a combination of all three in high school. They were very inventive and creative people who used media to their advantage to express their ideas. Students seeking up-to-date technological preparation will be at home at RIT. The engineering major actually takes five years to complete because of five quarters of required co-op experience. The applicant pool is small enough that RIT can go over your applications with the finest-toothed of combs. The CO-OP program mandates that by the time they leave, they are well-prepared to join the workforce. THE CAMPUS occupies 1,300 acres in suburban Rochester, the third-largest city in New York state. RIT also has international campuses in Eastern Europe and Dubai. 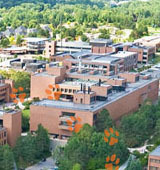 THE RIT STUDENT BODY consists of approximately 14,225 undergraduate and 2,980 graduate students. Enrolled students represent all 50 states and more than 100 countries. RIT is an internationally recognized leader in preparing deaf and hard-of-hearing students for successful careers in professional and technical fields. The university provides unparalleled access and support services for the more than 1,300 deaf and hard-of-hearing students who live, study, and work with hearing students on the RIT campus. RIT'S ACADEMIC CALENDAR currently operates within a quarter system with the typical academic year consisting of fall, winter, and spring quarter. Effective September 2013, RIT will convert its academic calendar to a semester system with the typical academic year including fall and spring semesters. RIT will ensure that no student suffers any loss of progress toward a degree due to the transition; that no student's graduation will be delayed as a result of the change from quarters to semesters; and that no student will see any increase in tuition or fees related to the transition. As part of the transition process, every student on campus will be comprehensively advised. RIT ALUMNI number more than 106,000 worldwide. RIT’s mission is to provide a broad range of career-oriented educational programs with the goal of producing innovative, creative graduates who are well-prepared for their chosen careers in a global society. The RIT community engages and motivates students through stimulating and collaborative experiences. We rigorously pursue new and emerging career areas. We develop and deliver curricula and advance scholarship and research relevant to emerging technologies and social conditions. Our community is committed to diversity and student centeredness and is distinguished by our innovative and collaborative spirit. Internal and external partnerships expand our students’ experiential learning. RIT is committed to mutually enriching relationships with alumni, government, business, and the world community. Teaching, learning, scholarship, research, innovation, and leadership development for promoting student success are our central enterprises. What are the top 3 things that students do for fun at Rochester Institute of Technology? Go to the mall or nearby shopping centers. Hang out with friends at Java Willys (coffee shop), Go out to sporting events, shows, concerts with friends. 53% of students live on-campus. The average student pays $27,639 for tuition, fees, and other expenses, after grants and scholarships. Total stated tuition is $33,932, in-state and on-campus, before financial aid. Learn more about financial aid at http://www.rit.edu/emcs/financialaid/. Estimate the net price for you at http://npc.collegeboard.org/student/app/rit. The typical (median) early career salary of Rochester Institute of Technology graduates is $53,500, according to Payscale. Rochester Institute of Technology participates in the NCAA Division III for college athletics. Want more info about Rochester Institute of Technology? Get free advice from education experts and Noodle community members. What is RIT housing like?